Armed with a Master’s Degree in Education and Technology , Terri worked a full-time job directing a distance education network for 9 school districts, 3 area technical schools and a university in Jefferson and eastern Dane counties. 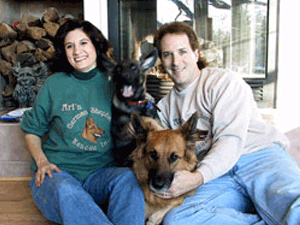 Terri and her husband, Perry, ran their own small business, Media Paws, which produced videos and Web sites – many of them for local humane societies, animal educators and trainers. In the year 2000, “Terri compiled a book, listing all [of] the animal-rescue groups in the state [of Wisconsin], information about them, pictures of dog breeds and details on how to identify them” – all at her own cost. Annually thereafter, she also updated this 125-page directory. In 2001, Terri and other like-minded individuals spoke to the Wisconsin State Legislature in favor of an anti-puppy mill law. Terri was in charge of the website and e-mail listserv for the [WDR] and Pet Rescue Network (an umbrella organization for groups caring for stray and homeless dogs). The group has hundreds of members, representing different dog breeds, cats and other creatures. Through WDR, Terri helped establish screening rules for rescue groups (see our article entitled “How do I know if I’m dealing with a Reputable Rescue?”). 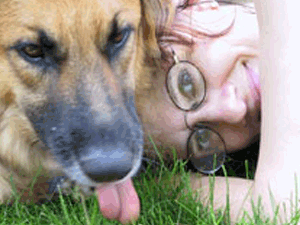 She also fostered better communication between shelters, rescues and even veterinarians. Terri designed and produced not only her own website, arfrescue.com, but also designed and produced the website of her friend, Sarah Kalnajs, owner of Blue Dog Training & Behavior, LLC (bluedogtraining.com), as a gift. 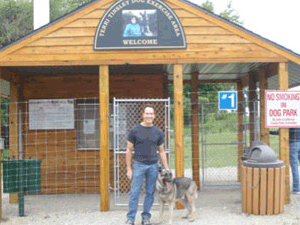 She played an instrumental role in getting the Jefferson County Dog Park approved. 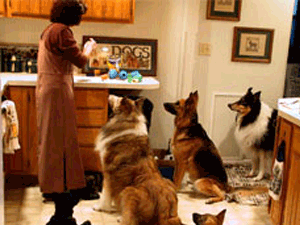 Terri also spearheaded many events to educate people about animals and raise money for rescue organizations. Terri and Perry, both, loved and cared for their own 4 dogs, 2 cats, a parrot, and a complete aviary in the basement! You have gone to the Rainbow Bridge to give love and hope to animals that are no longer with us on Earth.